An off-grid solar (photo-voltaic) electric power system is an ideal prep that can partially or totally relinquish you from dependence upon other systems (the electrical power grid), which themselves are vulnerable to disruption or breakdown. Off-grid systems also enable the ability to live away from the mainstream, which opens the door to properties that are away from public utility systems. Even if living in suburbia, installing an off-grid system side-by-side with the existing electrical system could provide you with a completely separate electrical circuit (separate outlets, etc., however you design it – unless you ‘grid-tie’). It will reduce your dependency on the grid as well as provide a back-up means of electrical power during a grid outage or disaster situation. Although there is much more to know regarding the proper design and construction of an off-grid solar power system, the following basic essential elements will give you a summary of the main components involved. A typical off-grid system and can be split up into four sections, each with their own function and purpose as listed here. The PV (PhotoVoltaic) solar panel is where it all begins. A typical solar panel is made up of an array of many small individual solar cells, made of crystalline silicone, each connected together to provide a usable amount of total power. Sunlight (photons) strike the crystalline silicone wafers, which convert that energy into electricity. Today’s typical residential solar panel may contain enough individual cells to produce hundreds of watts each (although there are lots of different sizes). The more solar panels, the more power you get. While a number of years ago solar panels cost about $4 per watt, nowadays the panels are commonly priced in the vicinity of $1/watt, more or less. To calculate the number of solar panels required (which will vary widely depending on one’s needs,) it’s all about the term ‘watts’. A ‘watt’ is a unit of power. First you need to determine the wattage of an individual appliance or device that you would like to power, and multiply it’s wattage by the number of hours per day that the appliance or device may be ‘on’. The result is a unit of energy which is required to power that device – power multiplied by time. You do this for each device and add them all up to get a total number. You might want enough energy to run a refrigerator, a chest freezer, some lights. Tip: Power is watts. Energy is Power x Time (watt-hours). This is a reasonable 24-hr daily presumption if cycling ‘on’ half the time. I used that meter with my own refrigerator and over a 24 hour period it consumed 1,360 watt hours. Again, if you plug a chest freezer into the ‘usage monitor’ that I just referenced, after 24 hours you would know exactly the kWh consumption per day. I used the meter on one of my own chest freezers which resulted 840 watt hours during a 24 hour period. This example of powering a fridge, chest freezer and a half-dozen light bulbs adds up to about 2,200 watt hours of energy consumed in a given day, or 2.2 kWh. Perhaps we add 800 watt hours as ‘extra’, which brings us to 3,000 watt hours of energy requirement (3 kWh). Now you need to discover the worst case scenario regarding the number of hours of ‘good’ direct sunlight that you might get per day in your geographical location. The worst case scenario for collecting sunlight is during the middle of winter. And depending on your geographical location it might not be much. Let’s say (for example) worst case that you get 4 hours of good sunlight on a winter day to provide electrical charging capability through your solar panels. This means that during those 4 hours, you will need to accumulate at least 3,000 watt hours of energy. 3,000 (watt hours) divided by 4 hours of good sunlight equals 750 watts of solar panel power capacity to absorb and convert 4 hours of solar energy into 3 kWh of electricity (to be stored in a battery bank). This means that you will need enough panels to come up with at least 750 watts. Maybe three 250 watt panels at a minimum (and that’s not counting inefficiencies of the overall system which is beyond the scope of this article). Suffice it to say, in this example you should have four of those panels. Or three 300 watt panels. The charge controller is an electronic device installed between the solar panel array and the battery bank (the batteries store the energy). The charge controller charges the batteries. It will provide a specific technique of charge to the battery bank depending on a number of factors – many of which are typically programmable into the charger itself (or predetermined or calculated by built-in smart-charging techniques). A good charge controller is intelligent in that it automatically adjusts depending upon system / battery demands or current state-of-charge of the batteries. A smart charge controller designed for PV systems will constantly flex with the amount of available power from the solar panels at any given moment. A good charge controller will also perform maintenance functions on your batteries to help keep them in optimum condition and to prolong their life. The charge controller is an essential component in the overall system. The battery bank is unique to the off-grid system (as opposed to a ‘grid-tie’ system which doesn’t use them). Since you do not consume all of your daily energy requirements during just daytime, an off-grid system will store the energy that’s collected during daylight into a bank of batteries to be used during the night (or cloudy periods during the day). Note: With most typical grid-tied systems, if there is a power outage, the power from your panels will not be available to you. The batteries used in off grid solar power systems are manufactured uniquely, and designed for ‘deep-cycle’ conditions with a rugged and heavy duty internal design. An additional consideration for the overall solar power system is the number of backup days that you may want to have energy in reserve. Cloudy days produce little or no electrical power – depending. It may be important to have a few days reserve energy, which means having more batteries to store that energy. These batteries are very heavy; they require specific cabling and inter-connectivity depending on system design; there are special considerations for their placement (environmental temperature, proper exhaust – depending on battery type, and safety). The most common off-grid battery type is Lead Acid. They are the least expensive. There are lots of good manufacturers that make specifically designed heavy duty off-grid lead acid batteries. Be aware of the pros and cons. Cons: Off-gassing & ventilation. Constant maintenance. Poor cold temperature performance. Depth of Discharge concerns. Battery types are beyond the scope of this overview, but it’s worth researching. 4 of those batteries in series would give you a 24 volt system adding up to 5,280 watt hours or 5.28 kWh of energy. However! You should not discharge a lead acid battery beyond 30% for optimum service life of the battery bank. So that means that you really only 30% available energy, or 1,584 watt hours with four of the aforementioned T-105 batteries. If we’re looking to get 3 kWh of storage, then we need twice as many in this example, or 8 of those batteries! See how that works? And that’s just for one day storage. 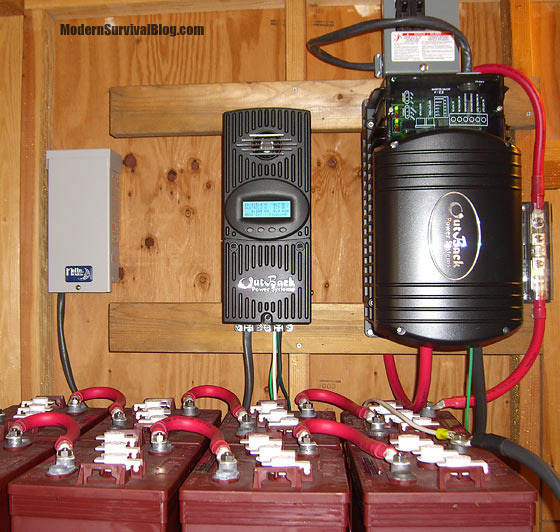 A battery bank will become a expensive part of your off-grid system if you do it right and when you allow for extra storage days of energy for cloudy bad weather days. It’s just the way it is. I could write lots of additional articles just on batteries and other considerations (and I will) but this gives you an overview to consider. The Inverter is located at the last stage of the solar power system. It’s job is to convert the DC (direct current) energy from your battery bank into AC (alternating current) energy that is used in the typical home. ‘DC’ refers to direct current, and ‘AC’ refers to alternating current. ‘AC’ is what is generated in electrical utility power plants and sent to homes to power appliances, etc. You will need this inverter unless you have special appliances and lighting to operate on DC power that’s the same as your battery bank voltage. Today’s modern inverters can be very efficient, so very little power is lost during the conversion process assuming you’ve purchased a quality unit. This too is a part of the system that requires research. There are cheap inverters out there which I caution against for several reasons, including the ability to handle short-term high current loads from motors and compressors starting up (refrigerators and freezers for example). Better inverters provide pure sine wave AC power and will not damage your appliances (or electronics). There’s lots of research and ‘figuring’ that goes into the overall design of an off-grid system. If you have knowledge in basic electronics it can be fun to do it yourself (and saves lots of money). I have a background in electronics and electrical systems to the extent that I’ve designed several of my own systems. They were fun projects for me! My latest system is still operating as I type this using energy from the sun. Hopefully this has helped some of you gain a better general understanding. What are your feelings on charge diverters? Unfortunately I cannot offer an opinion on that. I have not used one. Very timely. Have been making notes before contacting solar installers. Thanks Ken. I would like a little system consisting of panels, inverter, and transfer switch on top of my well house. Only need to run well pump (1 hp 230v) to fill a tank, chest freezer, and maybe a couple other 110v items, and only during the day. After help out at DFM’s off-grid cabin am just not interested in maintaining a battery-based system. Is something like this doable at a reasonable price? It is a little more complicated to do (1 hp 230vac). You would need two separate inverters each providing 120 vac. Each 120 volts alternating current (vac) provides one half of the 240 vac circuit. It can be done, but 240 anything is basically twice the price. The list of “wants” you have provided will require a lot of panels, batteries and as I said, a second inverter from another battery bank. “I’m just not interested in maintaining a battery-based system.” Please check out a dc (direct current) pump for your well. They have available, pumps that will kick on when there is “enough” sun and kick off when there isn’t. They have pumps for even very deep wells and are hooked directly to solar panels, no battery at all. The trade off is that the pumps are low volume, maybe 1-2 gallons per minute. Might be perfect for pumping into a tank, as you mentioned. I went with Aquatec but there are others as well. My set-up is for 200 feet depth for pipe and uses (2) 100 watt panels. It pumps a little more than 1 gallon per minute. Chest freezer/fridge consider dc units though it’s a tough call. None of this is cheap. I just switched out batteries, again. Did I mention nickel iron batteries DO NOT work as advertised. I’ve been doing solar/wind for about 12 years now. My stuff is all off-grid and I did it myself. Learned some hard lessons along the way, but mostly an expensive success. Um, two 120 volt inverters, each suppling one leg to make 240 volts. Yes, but you better make sure that those inverters are ‘in phase’ together, or you could have some serious problems. There are 240v inverter schematics online, and I suspect you could find one off- the-shelf unit from a foreign country (China, Malaysia, Taiwan, etc) that puts out 240 volts AC. Just saying, anytime you try and run two inverters into one feed, you best make sure they are in phase. Just my opinion for what it is worth. Pretty sure Outback makes 240 output inverters, a frind of mine who is off grid has one, can run his shop tools no problem, battery bank is huge though, think his system runs 48v has 40 big batteries wired up and a huge array covering his roof, he sized it so he could run his shop pretty much, was overkill, local solar company said they couldnt do it so he soursed it out of the PNW somewhere. Yup, I think Anony Mee can find an inverter perhaps with both 120v and 240v output if she looks around. Main thing I was trying to point out is that you should never feed into a 240v supply with two legs of 120v from different inverters unless you can somehow make sure they are in phase together. I think that charge diverters and the inverter disconnect are the same thing. If you plug in an electrical device that draws too much power it will stop the draw automatically. After a minute it will put your system back on line. That isn’t a very good description but it is the best I can do. My one thousand watt system is almost completed. I expect to be using it next month. Then the experimentation and learning begins. Sounds like an over-current or over-draw protector??? Been doing some re-wiring on the House to accommodate the Auto-Transfer-Switch(ATS) for the switching from Grid Power to Solar Power, takes a separate “Sub Panel” and some interesting wiring lockouts on the 110-220 side. I believe Ken has done this also. Can ya tell I don’t want to be without power?? hehehehehe Addicted to the good old electricity I guess, and makes for a hell of a selling plus for the house. Tis a slightly complicated system, but why not sell the unused Solar Power back to the Grid for 80¢ on the Dollar? FYI, ya must live on a Grid System that still allows that. Thanks Ken, I’ve been thinking about solar backup. Told my wife this morning,I need to figure out the math on how much we need..Your article and explanation was very good, and timely now I need to consider my age, whether or not it would pay for itself in my lifetime. Maggie’s Farm honestly it’s not the payback from the grid. I chose NOT to use Grid Tie because the Solar PV system was for my emergency needs. The vast majority of grid tie system SHUT DOWN for safety reason if the Grid is Down. That and being linked by a version of a smart meter to the greatest hacker target in America the Grid seems odd for a preppers. To bring the value of a few hundred watts of power to your attention please go to your circuit box and shut off the main breaker. Notice how quiet and dark you house is aside from sunshine? Think about that Refrigerator and Freezer. A few hundred watts of power and careful use opening and keeping closed can allow them to keep food fresh. A microwave and or slow cooker same story. If it’s hot, a box fan needs few watts to give you a nice breeze. Mosquito issues? Some cheese cloth bag net and a box fan is a Proven Mosquito killer in Africa. If it’s cold? That wood stove is really HOT over there but a fan could spread that nice heat all around. Maggie’s solar is Modular. Do some research, think of the largest system you NEED vs. WANT and then paper build it. A Renology 400 watt system is a good start although their controller is odd. However with your research you would know the PWM Controller is easy to upgrade cheaply. A pure sine wave inverter is my choice. After SHTF I doubt I can shop Amazon for a replacement Microwave. Hope this helps you to try solar power. My 93 year olds Oxygen system and breathing treatments work very well on it. I’ve had some correspondence with some people who have asked my advice regarding various life-sustaining medical apparatus during grid-down. I’m curious about the quote I’ve copied above. I know that oxygen is simply released from a pressurized tank for the patient (no power required). What is the rest of the oxygen breathing system which requires power that you’ve tested on your Renology 400 watt system? Ken a tank of Oxygen requires zero power. However even a Large Tank at the 3 liters a minute Mom requires is flat empty in around 10 hours. That is my back up to the Oxygen Concentrator system. Her Primary Oxygen system is an Oxygen Concentrator that takes room air and somehow increases the concentration of Oxygen for her breathing needs. We use them a lot in the MASH Operating Room as tanks can be dangerous. She also takes 4 times a day powered breathing treatments of breathing drugs. Mom also has a portable version of the Oxygen Concentrator that runs for 4 hours per charged battery. So in a bug out from a Forest Fire she can still breathe. Currently she has almost 90 days worth of breathing drugs as they are not regulated and the companies are eager to send more. All of the above are easily charged-run off a 400 watt system leaving spare power for fans, lights and if the sun is bright a slow cooker. Ive been thinking about getting a windmill, our site usually always has a decent breeze, 10-12 mph. The unit i was looking at starts at 7mph. Thats always on light or dark if theres a breeze. Tommyboy wind units are a very difficult subject to discuss on a thread. As an old hippie and having a lot of old hippie friends who are now full time Solar and Wind Power dealers I have too many stories of success and failures with wind power. Wind power needs a clean (well above obstructions like trees-houses etc.) pretty steady wind in a fairly narrow range of acceptable wind speeds. With all the trees around me I’d need a 150 foot tower. Then I would have to deal with days of no effective wind to even start producing power, Mixed in with storms like two nights ago 50+ MPH gales that knock down trees and BTW damage Wind Generators. Add to that the effects of Ice Storms. They need specialized controllers to parallel the solar controllers AND Load Diverters to burn up power and act similar to Brakes when the wind is too powerful. Not worth the money when I could just buy a bigger battery bank and more solar panels. Now on your Island with fairly steady sea breezes or somewhere in the treeless Midwest a different story. NH. All very valid points. You sound well versed on solar.I appreciate your intelligent reply. I am seriously considering solar after reading your input. Thanks. Let there be light. Sorry Maggie’s for the double post had an 93 year old issue to deal with 🙂 Family care…. Thinking about the pre-electricity era. What is the value of recharging/powering your radio-CB-SW radio, maybe even a cell phone if your power is out but maybe the broadcasting/cell system is up? I have a set of battery tools, really handy along with my electric chainsaw. My 40 watt electric chainsaw is a Beast, really nice for light chainsaw work like the 50+ MPH wind storm two nights ago. Cleared those limbs and that small tree away. More firewood. 🙂 Solar recharging is really useful all around if or when the Grid is down. A few hundred watts of solar, a controller, a decent battery bank an inverter and your set. You CAN run extension cords to power things just like when you run a Generator as not to rewire the whole home. Your battery bank can also make your Generator usage more efficient as the Generator can Charge your battery bank to power things like the lights instead of running a Generator for a few hundred watts of lights and fridge. Please look it over friend. Worth a few hours of research. Being realistic, the cost of energy from the grid is cheap. To install a solar photovoltaic system is comparatively expensive – especially if it’s off-grid style with battery bank. I personally wouldn’t do it to save money over time. I’m skeptical about the contractors and companies that install grid-tied systems and proclaim that lots of money will be saved. The reason that I installed my current system (and the previous one where I used to live) was for preparedness sake (coupled with the ‘engineer’ in me). I’m into Level-4 preparedness and this is one aspect or category for me (sustained self sufficiency – power generation). When I started my last solar project where I currently live, I was blessed to have sufficient funds to do it. And I’m glad that I did. Today is another story (not so well funded 😉 ). I don’t want to put out the impression that solar power alternative energy is a way to save money. In my opinion, it’s not. That said, it’s a great way to become more independent if you can afford to do the project! Harbor Freight has 100 watt solar panels with controller and wiring (no battery) for $150. If one bought these, one at a time, with a single battery, and tied the batteries together to slowly build up to a 1kw capability, could you use the same inverter assuming it was 1kw capable or larger? Would it be cheaper to just buy the components separately? Check out Amazon, they have a bunch of different sets that are higher wattage and come complete, not too bad price wise either. Dennis PLEASE do not use Harbor Freight Solar Panels. Plastic framed @^$%# and easily damaged. I tried one set for a boat project, never again. Even the controller and wiring harness are ^%$*#. I buy throw away stuff from Harbor Freight and sometimes get a good deal for what I paid but Solar is not one of those deals. Even their battery drills often smoke out in a few weeks of real use. A Renology 100 watt panel is a solid built panel often on sale on Amazon for around 123.00 Far better panel aluminum framed and excellent quality. PWM Controllers are cheap and once industry standard. MPPT are a little more efficient but pricey. I find them about 15% more power than PWM. Sometimes a couple extra panels and a spare PWM controller (for EMP) a pretty good idea. A Harbor Freight just opened in our town. The harbor it all comes from is somewhere on the China coast for sure. Was fun to stroll around though and pick up some small items. Saw the Solar Panels and yes they look flimsy. I agree. Solar/wind is not cheap when compared to grid power. I have solar/wind as a back-up to the grid. We use it daily to power fridge/freezer. My motto is use it rather than trying to store it. I like to keep the battery bank charged but, there is a significant loss when trying to store the power. I envy those who have access to mini-hydro-electric power. Wish I was near a running creek or river to provide nearly constant power. The sun doesn’t always shine and the wind doesn’t always blow. I guess that’s why I own a generator. I truly love air-conditioning in the heat of summer. I guess I’d learn to do without if shtf. I have one charge controller a 60 amp xantrac and one harbor freight inverter in a faraday cage. Does anyone have experience with harbor freight invertors???? I would hate to rely on it, but it is my back-up for now, $$$. Actually I think xantrac is now schneider, but it’s the same controller. – You didn’t say what size, but I have never been impressed with Harbor Freight Electronics. Watch for sales and you can probably pick up a decent Cobra for roughly half price. The Harbor Freight tend to fail spectacularly after a couple of months use. Plainsmedic pre A/C folks used to sleep in the basement or open porch. A hammock once you get used to it is pretty nice in hot weather. Something about not sleeping on a foam insulator aka mattress when your trying to stay cool. Please replace that Harbor Freight Inverter ASAP friend. I put my best stuff in the Faraday Cage because when EMP destroys the unprotected stuff I will never again be able to buy from Amazon a replacement inverter. I buy Harbor Freight items for throw away jobs. Wal-Mart is better quality and almost the same price I tend to notice. I have many tools from HF. Mostly end wrenches, screw drivers, etc. Hard to destroy an end wrench. Haven’t tried any HF electronics, dubious at best. I did buy a 1500 watt inverter on sale. It was a snap decision and probably not a good one. I’ve never used it. I put it in the faraday cage for what if. $$$ is always a concern for me, hence lots of DIY projects. It’s my intent to at least have a little bit of “back-up.” Minerjim pointed out the phasing on 240 inverter, excellent observation. Many times it is better to look for a totally different solution to the problem. DC pump powered by solar rather than trying to provide 240 vac for traditional ac pump. I’m not an expert at anything. I’m always on the look out for a different/easier way. Keep an open mind. Try to use gravity, wind, solar, fire, anything and everything to accomplish the solution to a problem. Still trying to decide on dc fridge/freezer. Just can’t seem to pull the trigger on that purchase. Built a zeer pot with grand-daughter for her school project. It works but, not a viable solution for any quantity of food preservation. I value the constructive criticism and insights of others on this site. I’ve learned a lot through the years, just reading. I’ve only started posting recently. Plainsmedic one of the reasons I chose to build a 12 volt solar system is that post SHTF I can salvage items from cars and RV’s. A 12 volt shureflo pump with a replacement seal and diaphragm kit is inexpensive and is a proven RV and 12 volt cabin water pump. If you want to get fancy you can even use it to pressurize your water system. I too watch my pennies but I also remember penny wise pound foolish when I am buying items that will be needed for years after Amazon is closed for business. Folks have lived with out refrigeration but you have to adapt your eating habits to suit. More fermented foods thus you need a fermentation system, more dried foods so you need a good sized solar dehydrator. However as my MSB friends like to remind me it’s not all or nothing. If you avail yourself of Antiques Collectors talents maybe she can find you a spring to develop for both water and a SPRING HOUSE. In the pre-electric era having a spring house was major value as a early refrigeration system. You could design a solar system to power a small freezer. And so forth. I am a High Tech Redneck and Proud of it 🙂 Maybe you are too? My 12 vdc solar and wind hybrid system has frustrated me at times. The larger wires required for 12 vdc can challenge ones ability to scavenge. Oh well, 12 volt is what I built so I’ll stay with it. I too have thought about using 12 vdc automotive batteries after a shtf (emp or CME).. There would be a lot to salvage but they wouldn’t last long in a solar recharge scenario. I have acquired as many 12 vdc appliances as I can, ie; fans, pumps, lights, etc. All could be re-configured into useful items. I even have envisioned a swamp cooler type Air Conditioning set-up and acquired the necessary parts and pieces. Wouldn’t work for the whole house but I could cool off one small room on 12 vdc and a battery or six. It’s enough to keep a man’s brain engaged, that’s for sure. Lots of things to consider and they all take parts and pieces as well as the knowledge to put it together if need be. Mostly I think about the women and grandkids. Hope we don’t ever find out just how prepared we were!!! Plainsmedic have you visited the BHA webpage I pointed out earlier? Lots of great information and the interesting links are a High Tech Rednecks dream. If your ground water allows a root cellar a lot of my family in the Depression slept in there during the summer heat. A mighty useful thing a root cellar esp. if you build a false wall as to conceal a spare room 🙂 Ventilation pipes are a Root Cellar standard, what’s an extra set? Just a thought. Also I helped a friend drive a sand point well in his root cellar. Closer to the water level, away from the ears and eyes of nosey souls. We NEEDED hearing protection as the pounding was loud inside that root cellar. Water and a safe place to hide stuff. What a deal! I did visit the BHA site this AM. They have lots of goodies. Plainsmedic if the root cellar is wet only when it rains look at the slope of the ground around it. Surface water from rain can be rerouted using a French Drain. A bit of work but easier than digging a new root cellar. Note that water always takes the easy path so give the heels of that horseshoe shaped French drain a nice down slope away from your root cellar. That should cure the surface water issue. Now I wonder how deep your real water table is? Doing a driven well inside the root cellar has at least three benefits. First Your starting your driven well already several feet below surface water. Second is nosey neighbors will not know of it or at least with a little camouflage noise like a Boom Box or such the driving should be concealed. Third that pump should never worry about freezing being inside a root cellar. Fourth a great place to have a few food grade barrels as a cistern to pump from using that 12 volt Shureflo pump we discussed before. Fifth benefit is a nice dry cool place to sleep when hot weather is a problem AND in a frozen house situation a decently warm place to sleep when the house is an ice castle. Sub terrain temperatures tend toward the 40’s and 50’s degrees. Often better than an unheated house at outside temperatures at least in NH Winters. Could it be worthwhile to French Drain your scaredy hole? Off of the current topic, but I’m curious about your comment on Level 4 preparedness above. Have you done an article on this? Without hearing of this beforehand, I’ve thought about levels of preparedness so I’m intrigued by your mention of it. Tell me there is ANY reason that you would not consider these please. Only 57 cents a watt and good quality. Florida Prepper, Sorry for the delayed response. Bear in mind, shipping (freight) costs! Your savings may go out the window at that point (maybe). When I bought panels for my latest system I sourced them from a distributor here in NH and picked them up myself. That saved some money for sure. As far as the panels themselves (in your example), I am not familiar with the specific brand (which isn’t saying they’re inferior in any way). I notice they have not been reviewed yet on their site. I suggest to research manufacturers that have been around for awhile and are widely used in the industry. At least that’s what I did before purchasing what I currently have. They came from a company in Oregon. Thank you Florida Prepper! while I was looking up your Canadian solar panels I discovered I was wrong about my understanding of MPPT controllers! First the Canadian Solar panels like most are made in China. Second they are pretty good panels. But thanks to you I have a far better understanding of MPPT controllers and much like sine wave inverters why I need to upgrade my system and the Faraday Box back ups. PWM chokes off excess voltage to the batteries to protect them. MPPT converts the voltage into what the batteries can use AND protects them from overcharge. Worth the expense! A good day if a bit cold and windy. What do you know or hear about Peimar solar panels, made in Italy? Place near here sells them, like $200 for a 300 watt panel. Still trying to save up for a system, too many other things on the list above them though. I’ll have to pick up some more side work and work this list down. Woukd like to have at least a 150o watt backup system in here. Minerjim I personally know nothing about the Peimar solar panels. However If I was a betting man I’d bet they are imported from China and sold under an “Italian” label much like Canadian Solar is a Chinese company. Maybe you can search engine them? What is the peak voltage? Amp hours? Shipping from Italy might be expensive. Warranty offered? BHA solar has an excellent 400 watt system with a PWM controller a 1600 watt sine wave inverter with a USP charger port for cell phones and such for 1200.00 I might upgrade to a MPPT now that I understand the advantages but the PWM controller will work fine as the Panels of that system are FOR 12 volt systems (17-18 volts if I recall correctly). A lot of cheap solar panels have pretty high voltage. A 36 volt for example panel could be throttled down to a 12 volt system by PWM but you lose a lot of that wattage. A MPPT converts that 36 volts into what the 12 volt battery can accept. In automotive terms PWM uses a Brake the MPPT uses a automatic transmission. Minerjim, be cautious of what others tell you. Do your own research. Associating ‘high voltage’ panels with ‘cheap’ is NOT true whatsoever. Also, implications that a 12 volt system is a good target, depending on what you’re goal is, can be VERY inefficient and potentially a very bad decision. The voltage of a given panel design is rated in a number of ways. Voc (open circuit), Vmpp (Maximum power point voltage). A panel’s actual voltage is determined by the number of internal modules per panel (and how they’re wired internally). It does NOT have anything to do with quality. None. Like I mentioned earlier, my panels were purchased from a company in Oregon (Made in the USA, although some apparently made in Germany). SolarWorld. Sunmodule Pro-Series XL. I have no affiliation or financial benefit from naming them. I’m just mentioning as an example. They just so happen to be 300 watt panels (they make many wattage variants, as do other companies). Voc happens to be around 39 volts if I remember correctly. Under load somewhere around 33 volts. Power (watts) equals volts x amps. The voltage is simply one factor among MANY of an overall design. Temperature affects panel output too (they like it cold). I have them wired in groups of three in series, ~120 volts – although up to 140 volts when it’s 20 below zero outside (an important factor when choosing the right charge controller). I am using a MidNite Solar charge controller which handles all of the solar panels nicely while charging my battery bank (48 volts – which is likely the most popular voltage for typical off-grid home battery banks these days). Sorry Ken I was imprecise in my terms. I intended to say cheaper PER Watt tend to be high voltage panels. Did not intend to imply that they were cheaply made. I choose 12 volt systems for reasons I have articulated before. I am well aware that higher voltage systems are more efficient HOWEVER once SHTF I doubt you will be able to buy anything new to fix or expand your system. However I have for decades scrounged older 12 volt items from old RV’s and automobiles. I suspect after SHTF I will still be scrounging stuff from vehicles. The thing is NH Michael, there are LOTS, and I mean LOTS more options, applications, devices, appliances, tools, etc., than being limited to a 12 volt DC system. If SHTF to the extent that you’re referring to, I will be EXTREMELY happy that I chose a 48 volt battery system and DC-AC inverter to power nearly anything there is, for nearly any application that you could think of. With only 12 volts, I would be up the creek without a paddle for many of those options. I prefer to have more options. Additionally, I could turn that 48 volt battery bank into 12 volts easy peasy if I wanted to. But I most likely will not have a need to do so. Ken I am glad your happy with your system. For my curiosity could you give me a ball park dollar cost of your system? I have a little over 3K in mine counting my spares. I happen to have two compete systems 12 volt one in a Faraday Cage in case an EMP or rude people with rifles choose to shoot at my panels. Currently I am discussing with my beloved about putting a third system aside for expansion after SHTF. I think you have a spare controller and inverter in your Faraday cage from what you’ve posted before. That’s good. I can live with out electricity but I strongly don’t want too. A small freezer and small fridge is too handy as is rechargeable battery tools, chain saw, electric wood splitter, welder, lights, fans and 12 volt water pump system. When I was in the Philippines’ I was involved in remaking junk car batteries into deep cycle batteries. The lead melting and reforming was kind of cool. Bullet Casting on a grander scale. 🙂 USE a Fan or lose brain cells. I expect I’ll have a fair number of salvageable car batteries for this kind of project later. I’m a high tech redneck or maybe an old hippie but I love to tinker and modify stuff. I am also cheap with a dollar so I fix stuff often. You should see my resoled winter boots with Old Winter Tire Treads. I’m hoping for 50K miles from them :-). Every day I try to learn something new, if interesting I buy books on the subject. You should see my Plan B library storage. Every day I try to do a kindness for someone. Both makes my day. Maybe someday I’ll figure out some of the magic of computers 🙂 I can barely use them. Thank you Ken for all the work you put into MSB. NH Michael, I’m not going get into an argument with you about “yours is bigger than mine” or “mine is bigger than yours” either in size or how you use it. You brought it up. Not me. What does that say? That said, it looks like you’ve avoided the notion of my comment that there are VASTLY more options to integrate ‘devices’ rather than those limited to a 12 volt DC system. If one is in an RV, I get that. But that’s not what we’re talking about. I am not knocking whatever it is that you’ve done. I’m simply presenting my own opinion that limiting yourself to 12 volts is quite, well, limiting. I don’t want others to think that it’s okay to be limited in their options. On one hand I can understand the scavenging that you would do in a 3rd world country (as you’ve exemplified) and you do whatever it is that you need to do with what’s available to get the job done. HOWEVER here in the United States of America we are blessed with the availability of just about anything and everything. I will NOT limit myself just because that’s what’s cool in a 3rd world situation. I will advantage what I have here and now. That is what’s relevant. Thanks for the comments. I have to agree with Ken, the higher voltage ( 36v, 48v) panels are what I am looking at. the higher voltage systems have a lower (percentage wise) power loss overall. Still doing my homework, checking things out. Looking at these different manufacturers and checking out their operating histories, as well as their keeping their promises on the warranties. I can see NHM’s thoughts on 12 volt systems, but like Ken said, you can always use a transformer to drop that voltage down from 36v or 48v systems. Lots of options as you said. Glad to see that the price range for panels is coming way down, around $200 for a 300 watt panel (36v) for many of the name brand manufacturers. I want to settle on one brand and stay with it, including upgrading and adding on in the future. Should be able to do that to some degree across the board, but still think staying with one manufacturer would be best. thanks for the input. And again, thanks Ken for all the work you do to keep this site going. Ken thanks, I am still learning about solar. Every post is helpful. Wish there was a way to print the article without the blog. There probably is I just am not aware of it. Will explain how to print what you need, will contact you tomorrow. I have bought a 7 watt solar panel from Menards…. several years ago…maybe 5 yrs. It is very sturdy. Even on cloudy days it seems to collect some charging ablities. I had installed LED lights in the trailer and a 12v stereo. Phone charger. Used them all the past weekend. Had the solar panel facing the sun?? ?/rainy-snowy clouds through a window inside the trailer. Used the regular truck battery for way less than half that time running 2 regular 12v bulbs……. Joe c,with enough panels you can charge with moonlight. it would take a heck of a lot of panels though. I hope Ken doesn’t mind but the BHA Solar site is very useful. I have had good successes using their products and they are well priced for the quality they provide. Their information is solid and anybody who can read and follow directions can set up their systems. Solar PV panels, Solar HOT Water systems, small wind generators and such. I wish BHA was a Modern Survival Blog supporter. Our folks would use their products. Oh geeze! Just went over there for a peek. Yup, got my head spinning! thanks for the reference, very useful! Very first solar purchase was the older harbor freight set up. Worked well enough that I bought another one. I was always interested in solar, and that was a cheap/easy way to learn and school myself about the good/bad, do’s and don’ts of solar. Never regretted it. If you are new to solar, I would think $150 bucks for a HF set up is cheap tuition to learn about solar. Also for an FYI. Every piece of the harbor freight sets that I bought still works. Panels still put out 19- 20 volts after 10 or 12 years. I use the old charge controllers for power distribution hubs. The 12 volt cfl bulbs still light up my store room. But also upgraded to better LEDs. I have upgraded to better panels, xantrex charge controllers, batteries, inverters, yadda yadda. I don’t have a system like Ken. I’ve got $1600 bucks + or – invested. Champagne dreams with KoolAid money. Lol. But I use solar every single day. And have for over a decade. Something else I learned. If you have roof mounted panels. An easy way to clear off snow/ice, or just dust/dirt. In the winter I use a bug sprayer with winter mix car windshield cleaner. Just start at the top and go down. Even a cheap bug sprayer can shoot 15 feet or more in a stream. On the charge diverter, I just cobbled together a system to try and keep the batteries on my boat charged while in storage. If it is raining a lot the bilge pump can run the batteries down. If it’s not raining there isn’t much draw on the batteries but I’m not there to disconnect the panel. the idea here is the charge controller has a place to send the excess current where it can be shed as heat. when the batteries are fully charged. So far it seems to be working okay but only time will tell. We did use a solar setup which provided the vast majority of our needs when we were cruising on our little sailboat. We did not hve a charge diverter but we had a lot of need on the system and really didn’t need to worry about overcharging. We were able to run a small 12 volt fridge 24/7, listen to the stereo for several hours a day, chat with friends on the VHF, watch a movie on the 12 volt TV every night while running 12 volt incandescent bulbs and use a reverse osmosis water maker to pull fresh water out of sea water. We did this on 4 six volt golf cart batteries and two 55 watt panels back in the late 90s. We were able to have everything we wanted by keeping our wants down. Well almost everything, we couldn’t make ice but that was in Mexico. In Oregon the fridge had no problem making ice. One thing we did learn is panels work much better if they can be pointed to track the sun.. This is easily done but they do need to be adjusted frequently. This might be a job for those with not enough strength to be tending the garden, Geezer work might be a good description. This has more meaning the closer I get to being a geezer all though there are some that would say I;m already there! PS. modern LED bulbs would greatly reduce the draw that the incandescent bulb put on the system. – I do have a minimal solar system with a couple of John Deere “marine” tractor batteries (Given one, and the other cost me $20 for the core charge). Both batteries will power a 50-watt 12V incandescent bulb for around 7.5 hours, so I feel they are at least worthwhile for fooling around with. I currently have only a 40-watt panel which is stored in a Faraday cage/cardboard lined garbage can. I have played with it and I have been able to recharge my batteries with jumper cables from the car or truck.if I needed to. this will give me at least a minimal amount power if I find myself in deed. I have read of sailboats circumnavigating the world with a smaller power source. I have used it only a little bit, but it is a free power source for which I paid very little and I can run my 1500 watt inverter and the 1000 watt microwave off of the system if I limit my use and allow it time to recharge. – Should have said each battery will run 7.5 hours. Together they will run for 15 hours at 50 watts drain. House is already set with LED bulbs, and pre-run cords in the building with dedicated 110v outlets. What are the walls on the cellar? Masonry? Even if they are wood, there are products that will seal it from the inside, had some issues in my basement, same thing, CMU leaked a bit when it rained real hard, so painted this sealer onto the CMU and its never leaked since, and weve had some doozies rainwise. If its wood same thing, but can also lock in moisture and cause other issues.